Meet the ORD BOT. This little guy showed up at Maker Faire Bay Area this year, and is cheaper than most--if not all--other 3D printers out there. It's faster than them, too, according to its makers. The ORD BOT is a simple 3D printer platform kit that uses an extruder to "print" 3D objects, just like the Cube or the MakerBot. However, unlike the MakerBot, the ORD BOT can only print using one color at a time (for now, anyway). But what it lacks in color it gains in speed: Its print speeds exceed 400mm per second and can reach up to a whopping 1 meter per second. This is considerably faster than the MakerBot's output speed of 33mm per second. The ORD BOT comes with two different print areas with the largest, called the Hadron, being about 200 square milimeters. Now the ORD BOT isn't for just anyone--it's made with serious makers and DIYers in mind. This platform kit is just that--a platform: You have to provide your own electronics and build the whole thing from scratch (this does make it highly customizable and flexible), but according to a spokesperson at the ORD BOT booth you can order one with the electronics included for about another $200. There is also a wiki with various recommendations on electronics to use, as well as detailed specs and CAD files pertaining to the platform. 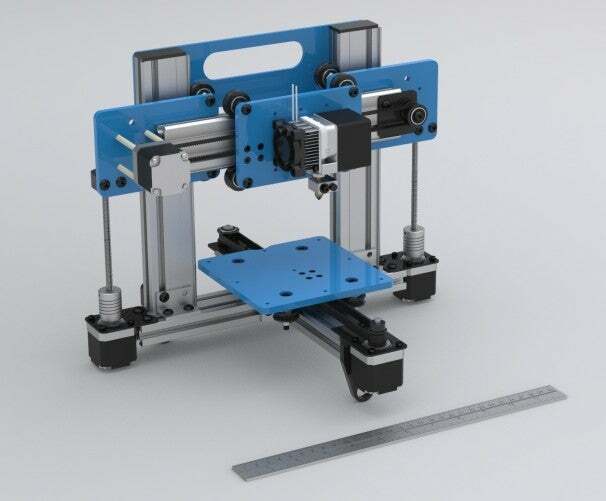 The platform will cost you $290 for the smallest one, called the Quantum, and $400 for the Hadron--the platform plus necessary electronics is still several hundreds dollars cheaper than other commercial 3D printers out there.